An Open Science seminar was organized at University of Helsinki on 19th of March in order to discuss the domain of the Open science and research (Avoin tiede ja tutkimus, ATT) project. The Ministry of Education and Culture coordinates this project that lasts from 2014 to 2017. 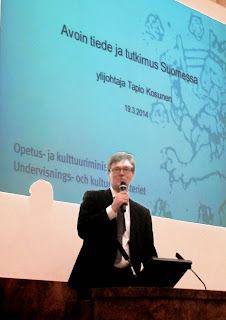 The seminar was opened by Director Tapio Kosunen. Kosunen provided motivations for open science including its importance in promoting science and the impact of science in the society. Openness is a central principle in research through which new opportunities for participation are provided for researchers, decision makers, and citizens. This requires that the publications, data, methods, skills, and support services are widely available. It is foreseen that the openness and digitization of the research provides for all new opportunities for collaboration and communication. This should lead to increased trust on science as well as support for entrepreneurial activities. 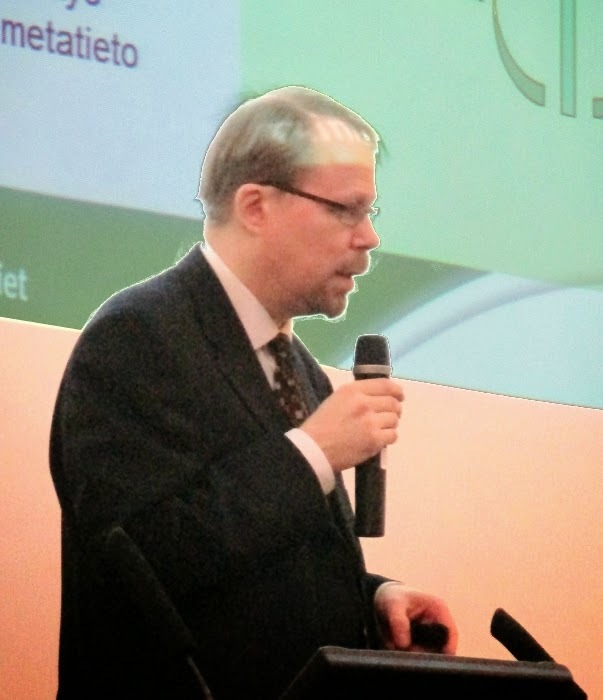 Detailed information on the project will be available at avointiede.fi. How does openness change research practices? How to implement openness taking into account ethical principles? 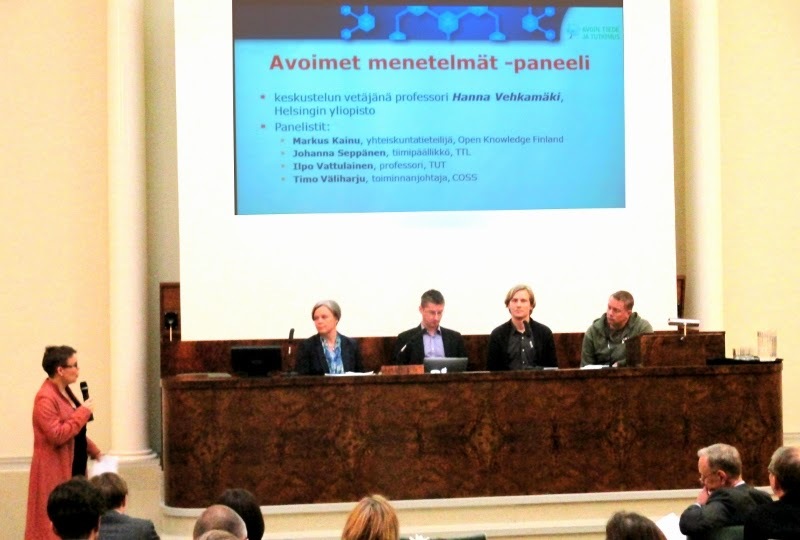 How to make openness to to be a part of everyday the practices among researchers? How should public funding policies be adapted to take into account the changes? What are the main priority areas for development? Does openness increase trust into science? How does openness support entrepreneurial activities? Does openness help in assessing quality of research? The panel discussion on open publications was chaired by Annikki Roos. 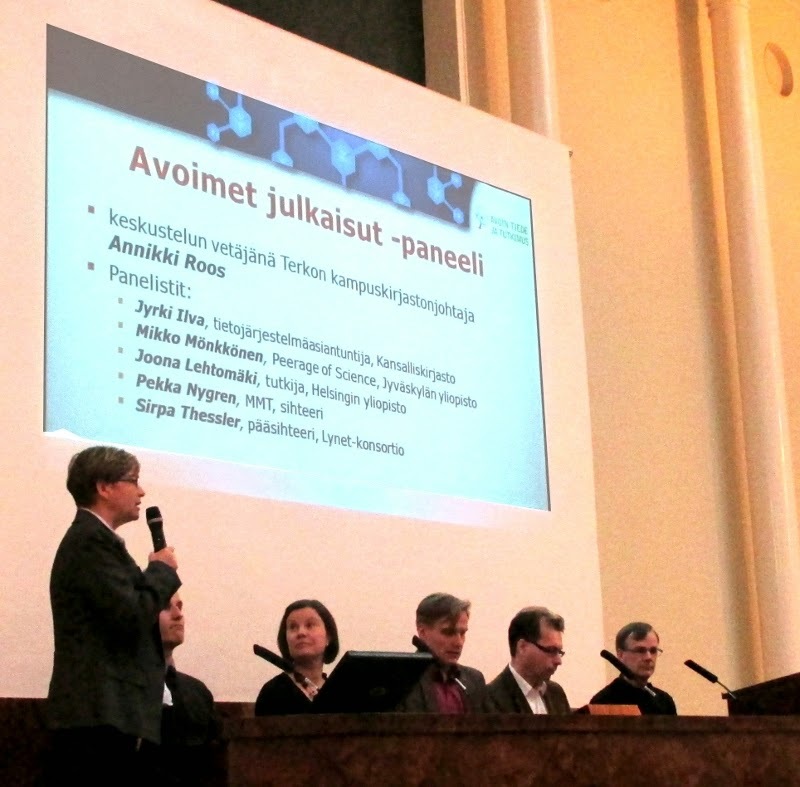 The participants, Pekka Nygrén, Sirpa Thessler, Joona Lehtomäki, Mikko Mönkkönen, and Jyrki Ilva, agreed with Tapio Kosunen about the positive sides of openness adding the fact that texts are becoming data for research. The group concentrated on some problems including predator journals, cost of publishing, and ethical problems. In open publishing, the author and publisher have typically a joint interest in publishing. This leads potentially to decrease in the quality of science: peer review may be shallow or even non-existing. However, same kind of quality problems are present also in traditional publishing. The panel on open data was chaired by Sami Borg who is the director of the Finnish Social Science Data Archive. 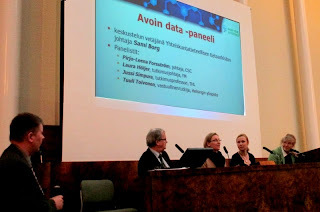 The participants were Pirjo-Leena Forström, Laura Höijer, Jussi Simpura and Tuuli Toivonen. Positive aspects were acknowledged mentioning separately democratic access to research, increasing innovation and international collaboration in exchanging data. Challenges that were mentioned included the need to build meriting systems, defining the ways how to cite data, and life cycle management. Professor Simpura advertised a Soterko event on 5th of May related to the last item. Thanks for the good coverage.